En la ciudad de Guatemala, sin embargo, existe un movimiento independiente, donde los activistas han ocupado la calle frente al Congreso desde el 22 de agosto 2011 . Aquí, las casas cálidas no fueron sacrificadas por tiendas de campaña, chozas miserables han sido cambiadas por tiendas de campaña. Los activistas de los barrios pobres se han comprometido a no salir hasta que la “Ley de Vivienda” sea aprobada – exigiendo una solución para la crisis de vivienda en Guatemala. La falta de un alojamiento accesible fuerza a innumerables guatemaltecos a vivir en barrios de asentamientos humanos donde las condiciones de vida precarias suelen tener consecuencias letales. El 22 de noviembre, la ley que se ha luchado durante años, una vez más no ha recibido su aprobación. En respuesta, tres personas del campo fuera del Congreso iniciaron una huelga de hambre. Mires donde mires hay carteles en el campamento. Las tiendas de color caqui, fueron entregados a las favelas después de un desastre natural. La electricidad es proporcionada por una escuela que está frente al congreso y los baños de plástico fueron donados por los movimientos sociales que los apoyan. En el campamento un fuego de carbón está ardiendo. Los acogedores activistas, sobre todo mujeres y sus hijos platican, en gran medida hacen caso omiso de la televisión. “Las condiciones son mejores que las que vivimos”, me aseguran. La política de vivienda de las últimas décadas se caracterizó principalmente por soluciones cosméticas afirma Helmer Velásquez del diario El Periódico. “Los residentes primero deben ocupar lo que es básicamente un pedazo de tierra inhabitable con el fin de llamar la atención de las autoridades. Después de un tiempo se les proporciona “importante” infraestructura, tales como gradas y callejones pavimentadas. Especialmente durante las elecciones se piensa acerca de las condiciones en los barrios pobres y sobre la legalización. Lacan afirma que “sólo durante las elecciones los políticos encuentran el camino a los barrios pobres. Entonces vienen con regalos tales como láminas y concreto, con promesas como el empleo, la educación y la salud “. 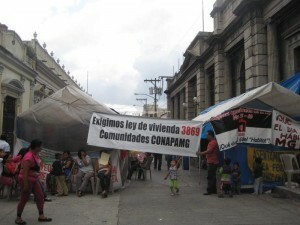 Independent from the Occupy Movement in North-America and Europe, a movement of slum dwellers in Guatemala is occupying the street in front of Congress. They are protesting against the living conditions in the slums and a disfunctional housing policy. To change their situation they not only occupied Congress but made a bill and eventually started a hunger strike. As crisis and poverty escalate in the Western world, activists in Europe and North America are now occupying city squares everywhere. In Guatemala City, however, an independent movement exists, where activists have occupied the street in front of Congress since the 22nd of August 2011. Here, warm houses were not sacrificed for tents, rather miserable hovels have been exchanged for tents. Activists from the slums have pledged not to leave until the “Housing Law” is approved – demanding a solution for the housing crisis in Guatemala. A lack of affordable accommodation forces uncountable Guatemalans into shantytowns where precarious living conditions often have lethal consequences. On the 22nd of November the law that has been fought for years once again did not receive approval. In response, three people from the camp outside Congress started a hunger strike. Everywhere you look there are banners in the tent-camp. The khaki-colored tents were given to the shantytowns following a natural disaster. Electricity is provided by a school in the street and plastic toilets were donated by supportive social movements. In the camp a coal fire is smoldering. The welcoming activists, mostly chatting women and their children, largely ignore the television. “The conditions here are better than where we live” they assure me. The protesters are some of the estimated 1.5 million inhabitants of the slums of Guatemala. Shantytowns are everywhere, in cities and in the countryside. Recent accurate figures are not available. Within the camp Roly Escobar, the sympathetic representative of the organization CONAPAMG, is having a meeting with his some fellow activists. We look for a quiet place to talk. Escobar has a thorough understanding of the situation having fought for years for the rights of poor neighborhoods. 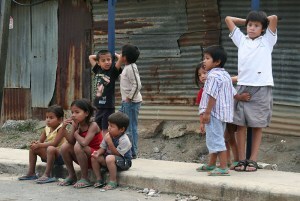 Escobar claims that in Guatemala more than 800,000 families live in shacks in the 982 Guatemalan slums. Around 420 of these are situated in and around Guatemala City. According to experts a fifth to one third of the 2.5 million inhabitants of the metropolitan area reside in precarious locations. Lacán worries about his fellow slum dwellers. He explains that you cannot connect water and electricity without being able to prove a legal right to occupancy. The settlements are not included in official plans for regional and urban development and so are not considered for infrastructure investment. This sometimes has disastrous consequences for the safety and health of residents. 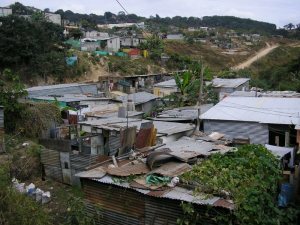 Over time residents often start to organize themselves, some areas acquire electricity and water, some shacks become more like houses, while others still resemble cardboard boxes. However, in spite of the age of a settlement, without legalization, the fear of eviction is ever-present. “Why do we go and live in a slum on the edge of an abyss or on a steep mountain slope? Not because we want to live like this, but because we hope to survive. People live here because they have no choice, there is no viable, affordable housing. Far too many people have nowhere to live” explains Brenda, whilst her five year old daughter jumps around catching her attention. The reasons why there are so many overcrowded slums are diverse. The recent armed conflict, natural disasters, population growth and a lack of land or work in the countryside have forced many Guatemalans to migrate to the city and live in the slums. Official figures estimate that by the end of 2011 there will be a housing shortage for 1.6 million households, of which 15% will be in Guatemala City. “The increasing demand exceeds the capacity of the State to resolve the incurred housing shortage” concludes the state institution SEGEPAZ. Those knowledgeable about the housing crisis and settlement residents agree that the government has never really tried to find a solution to the housing problem. ASIES, a research institution, found that since 1956 government action on housing has consisted of sporadic initiatives undertaken by inefficient institutions and of insufficient policy interventions, resulting in the accumulation of an enormous housing shortage. To remedy this situation the first “Law for Housing” was finally approved in 1996. Overseen by the Ministry of Communications, Infrastructure and Housing, the new housing initiative received a ridiculously low budget. The corrupt siphoning of funds by government officials, building companies, and representatives of neighborhood organizationshas left little to provide for those with housing needs. Applying for a grant under the scheme is not only a very long and bureaucratic process, it also requires the applicant to add a considerable sum of money, something many do not have. “Given the size of the housing problem, it was clear that this law was not a solution” concludes Lacán. On 23rd August 2011, when the bill was again not approved for the umpteenth time, some activists decided to set up a “Shantytown Congress”, camping in front of the doors until they are heard. “So many governments have come and gone and no one has ever taken us into account. Now we are here and we stay until they approve the bill” declares the elderly Doña Rosa combatively. Escobar wants socially responsible institutions and housing policy directed from a dedicated housing ministry. A good housing policy needs to have good law as its foundations. Academics however point out that a law and legalization are not enough. Attention should also be paid to education, employment, living conditions, in short to a different socio-economic model which breaks the vicious circle of poverty. Otherwise, the slums will continue to grow. 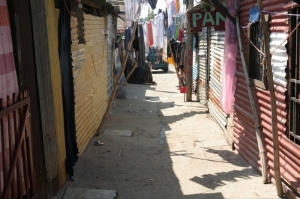 But after nearly four months in front of Congress the slum dwellers begin to lose their patience. After the bill was rejected again on November 22 three residents, including the young mother Julia, decided to start a hunger strike. If this new form of protest does not work and Congress does not approve the bill, it is likely that there will not only be further victims far away in the slums but there may also be victims in front of the door of the Representatives of the People. This entry was posted on domingo, enero 8th, 2012 at 23:11 and is filed under desalojo, Madre tierra, Ocupación, Opinión, USAC. You can follow any responses to this entry through the RSS 2.0 feed. Both comments and pings are currently closed.